Acupuncture is one of the oldest recorded forms of medicine and has been used in China for over 3,000 years. According to Traditional Chinese Medicine, energy, called Chi or Qi, flows freely through the body in channels called meridians. When there is a blockage in the channel the energy becomes stagnant and causes illness. Stimulation by an acupuncture needle at specific points on these meridians helps to restore the healthy flow of energy in the body. Modern science has shown that acupuncture stimulates the brain to produce natural pain relieving chemicals (endorphins). These assist the body to heal itself and give pain relief. The NICE guidelines also recommend acupuncture for chronic back pain and acupuncturists treat a wide range of conditions in a holistic way. During a session, very fine needles are inserted into points on your skin. These needles may be left in for up to a few minutes while you relax. Simon Littlejohn, Michael Rolls and Karl Grimm all use acupuncture as part of their treatments for pain relief. 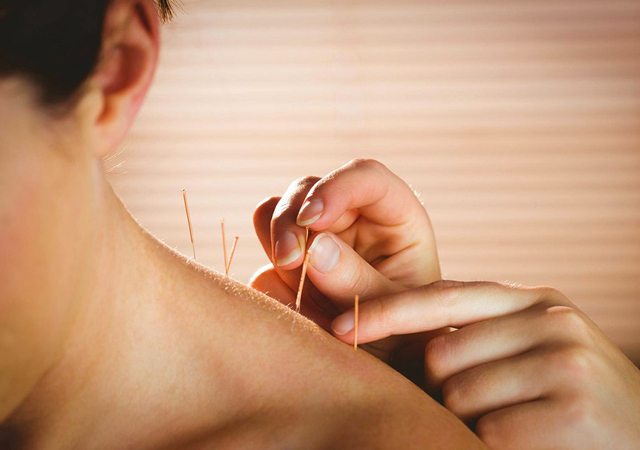 This type of acupuncture is also known as dry needling and is used as part of their general sessions when the need arises. Heather Thomson may use acupuncture during a session of naturopathy and she can also take bookings for holistic, traditional acupuncture on it’s own. Please contact us for more details if you are unsure what would suit you best. Please note: When Simon, Michael and Karl use acupuncture is used as part of their usual session there is no extra charge. Prices below are for traditional, holistic acupuncture sessions.